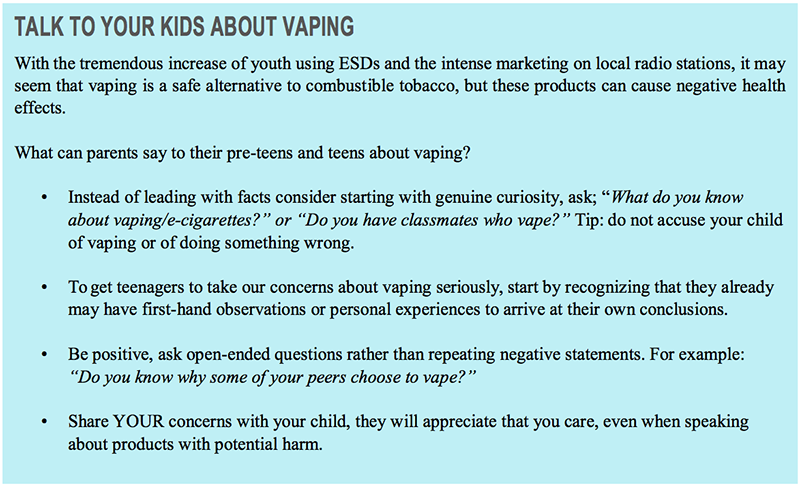 Many have heard the terms vaping, Juuling, dripping, draw, and e-smoke among others, but most don’t fully understand the laws that are in place and the repercussions of underage e-cigarette use. Below is a quick guide on where we stand with statewide and Kaua‘i County law. Across the state, youth are using ESDs at an alarming rate. According to the 2017 Hawai‘i State Department of Health Youth Behavior Risk Survey (YRBS), there has been a significant increase in ESD-use among youth statewide. It has been illegal in the State of Hawai‘i for youth to purchase or possess tobacco products, including ESDs, since 2016. Yet, on Kaua‘i, 24.7 percent of high school students and 23 percent of middle school students reported using ESDs in the previous 30 days (2017 YBRS). Hawai‘i State law prohibits the sale or furnishing of tobacco products, including ESDs and e-liquids, to anyone under 21 years of age. Under this law, which has been in effect since January 2016, youth and young adults under 21 cannot possess or consume tobacco products. 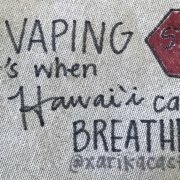 There is a $500 fine for anyone who furnishes tobacco or ESD products to a person under the age of 21 (§712.1258 and §321.212 Hawai‘i Revised Statutes). There is also a separate fine for those under 21 years of age and caught in possession of a tobacco product. The law poses additional problems for youth caught in possession of tobacco products, especially at school. On Kaua‘i, the typical procedure is to inform the Kaua‘i Police Department who will come to the school to issue a citation to the student and retrieve the device(s) and components to submit as evidence in the student’s hearing at either teen court or family court. The youth is then released into the parent’s custody. In addition to the state fine for possession of a tobacco product, youth are also suspended from school for violation of Chapter 19, Title 8 (Hawai‘i Administrative Rules for the Department of Education). The typical suspension spans three days; however, some have suspended up to 5 days, depending on frequency and severity of the case. While suspension may address behavior, this does not address the addictiveness of nicotine or help the student make healthier choices. The Kaua‘i Community Coalition Coordinator, Valerie Saiki, has been working closely with the Department of Education’s Kaua‘i Area Complex’s Superintendent, two local charter schools, Hale ‘Opio, and various afterschool programs to provide education on the health effects and dangers of tobacco products, including ESDs. In addition to the basic education, Valerie has been providing ESD-specific education classes at two public schools for students caught in possession of ESDs or tobacco products as well as an additional hour for students who go through teen court. Referrals for students addicted to nicotine or thinking about quitting are made to local cessation counselors at Mālamā Pono Health Center or the Hawai‘i State Tobacco Quitline. 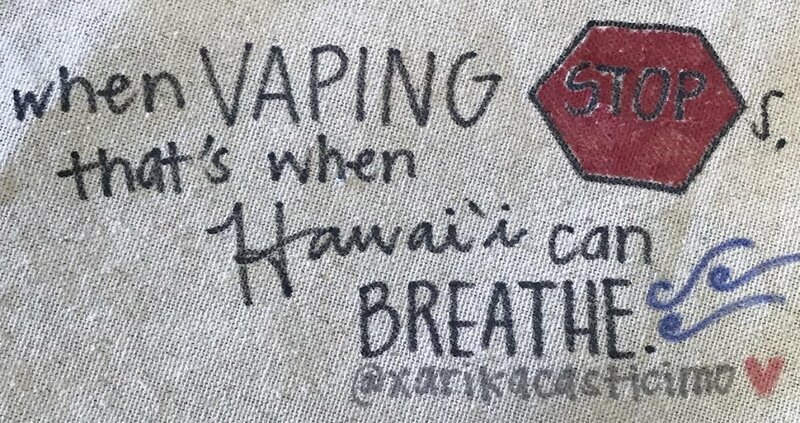 It is our hope that with policy change and continuing education on the dangers of this relatively new product, there will be a shift on Kaua‘i away from vaping. For more information about tobacco products, including ESDs in Kaua‘i County, please contact Valerie Saiki, the Kaua‘i Community Coalition Coordinator of the Coalition for a Tobacco-Free Hawai‘i (a program of the Hawai‘i Public Health Institute) at valerie@hiphi.org or (808) 591-6508 ext. 9, then 8. To contact a Coalition Coordinator for other counties, please visit our website at hiphi.org/tobacco.